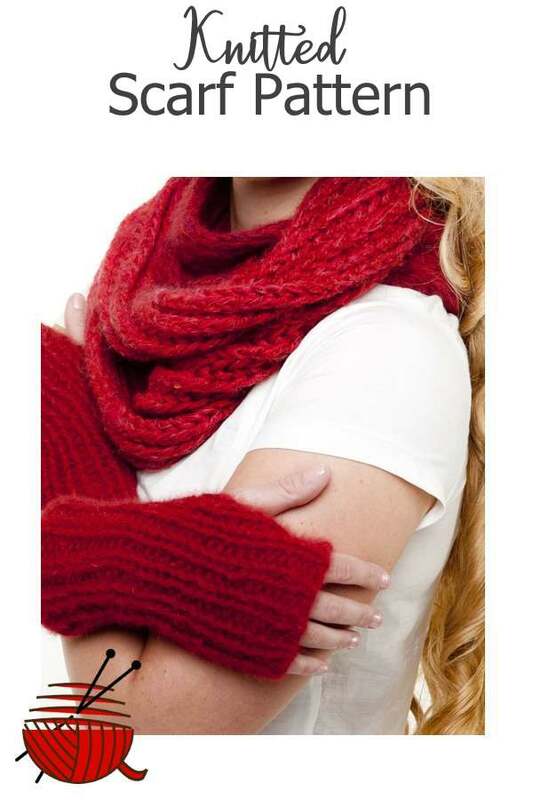 This Knitted Scarf Pattern is a project based on the information on the How to Knit a Scarf page. It shows you how a simple knitted rectangular can be turned into a favorite stylish addition to your wardrobe. Patons "Classic Wool" 100% merino wool, 3.5 oz/100 g/ 223 yds/ 204 meters. Yarn necessary app. 200 grams. knitting needles: Size 2 (2.75 mm) . Begin by deciding on the type of yarn and knitting needles size. You won't have exactly the same dimensions for your scarf as any other scarf even if you use the recommended yarn and needles so be flexible. We will begin to learn how to knit a scarf from its simplest possible variant. For example, let our scarf is a rectangular 8 inches (20 cm) wide and 50 inches (150 cm) long. Here are the steps you have to follow while knitting a scarf. Calculate the number of stitches and rows you need, to knit a scarf. 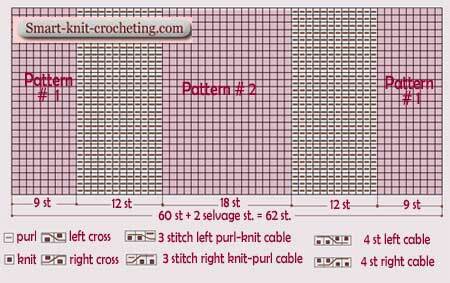 To begin a rectangular 8 in wide, you will need to cast on: 5.33 sts/in x 8 in = 42.6 (round to 43) stitches. Important note: Knit your own gauge swatch! Don't use mine, please. Most likely your gauge will be different than mine! That's it! Let's continue with our scarf. 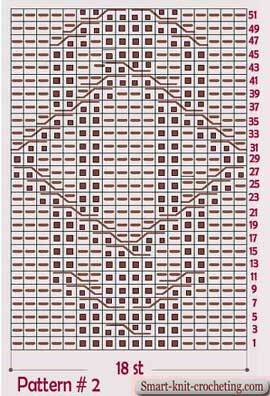 The knitting chart below shows you the knitting symbols which were used for this pattern. Three cable Patterns # 1 (9 stitches) and # 2 (18 stitches) are separated from each other by the 12 stitches of the knit strips on the right side of a scarf ( 12 purl stitches on the wrong side). The patterns #1 and #2 are the sets of the quite traditional cables. To make your finished scarf look accurate and neat, use steam blocking. Spread out a scarf on the ironing board or a table. 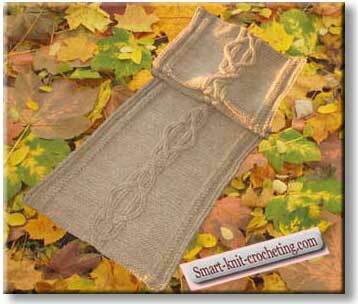 Stretch a scarf a little bit to the desired shape. Use headed pins for holding a slightly stretched scarf in place. Cover the scarf with a damp piece of fabric - a non textured dish cloth works well. Hold the iron above, iron your scarf. Don't press your iron the way you usually ironing! Just push the steam through the fabric and into the scarf. Let it stay for a while till it is completely dry.